Winner of TomTroccoli Memorial lottery: Anthony Giambone with the late Tom Troccoli’s sons Dave [left] and Chris. Fifty-one young anglers and their families enjoyed the serenity and beauty of Willow Pond at Caleb Smith State Park Preserve at the recent Friends of Caleb Smith Preserve’s catch-and-release 16th annual Junior Fishing Tournament. Nearly three hundred fish, including a 16-inch trout, were caught by anglers ranging in age from five to twelve. 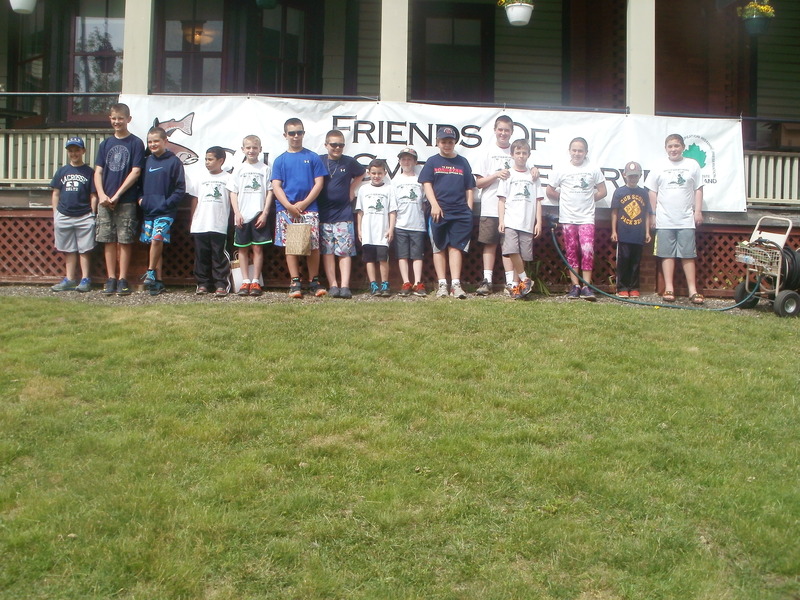 Winners of the morning session, for those ages five to eight, were: Ryan Green of Brentwood for the most fish caught: 17; Shelby Lloyd of Smithtown caught the largest pan fish: 10-1/4 inches; Ayden Zebrowski of Northport caught the largest “other” fish: a 14-1/2” trout. Winners in the afternoon session, for anglers ages nine through twelve, were: Anthony DiBenedetto of St. James, for the most fish caught: 22; Jack DiBenedetto of St. James caught the largest pan fish: 9-3/4 inches; and Matthew Bonnell of Smithtown caught the largest “other” fish: a 16-inch trout. Another highlight of the event was the Tom Troccoli Memorial Lottery, involving the twenty-six registrants in the afternoon session. The winner received a fishing rod and tackle. 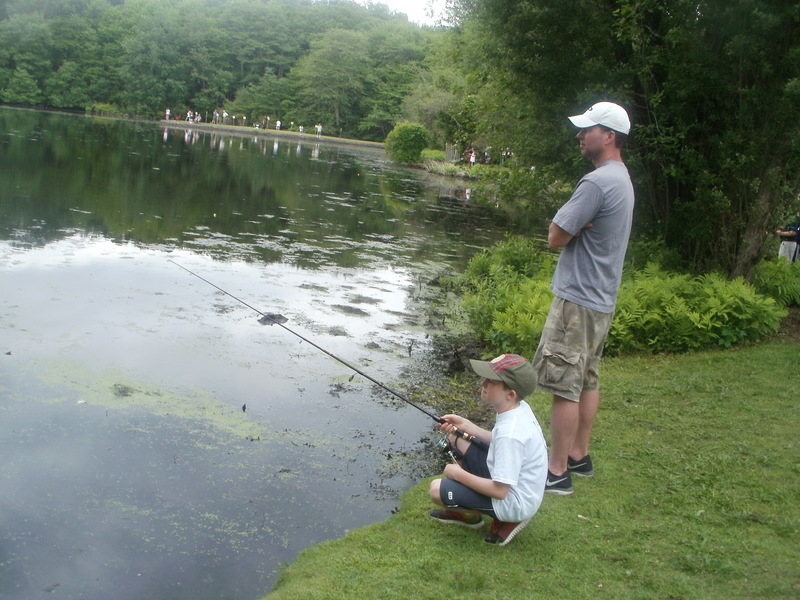 The drawing was held in the name of the late Tom Troccoli of Smithtown, who enjoyed fishing and had accompanied his grandson Joseph at two junior angler tournaments. The Troccoli family donated funds for the memorial lottery, which will be continued for many years. 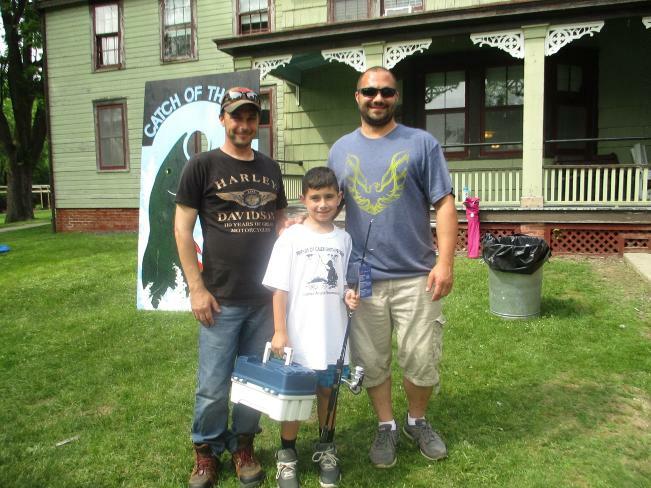 The late Mr. Troccoli’s sons, Christopher and David, drew the name of angler Anthony Giambone of Centereach, as the first winner of the Troccoli Memorial award. “Fishing was my father’s favorite hobby,” said Christopher Troccoli. “He especially loved teaching his grandsons. He started by teaching them to cast in his swimming pool. They got a real kick out of that. When we were young he would often take my brother and me fishing at Caleb Smith or Blydenburgh Parks.” Chris Troccoli’s two sons, Joseph and Vincent, participated in the morning fishing session. Tom Tokosh, chairman of the tournament, said he wished to thank Carmine Petrone, Huntington manager of Campsite Sports’ fishing department, who donated fishing poles for a raffle for the younger group of anglers; and The Fisherman magazine, which donated worms and tackle for the event. 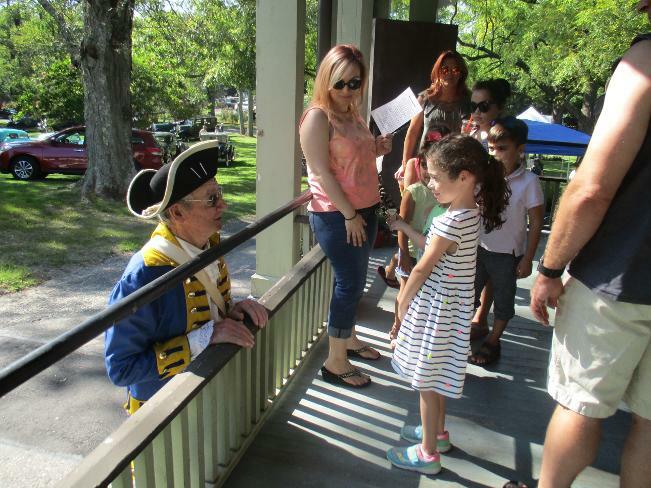 George Washington speaks with a youngster waiting on the face-painting line. 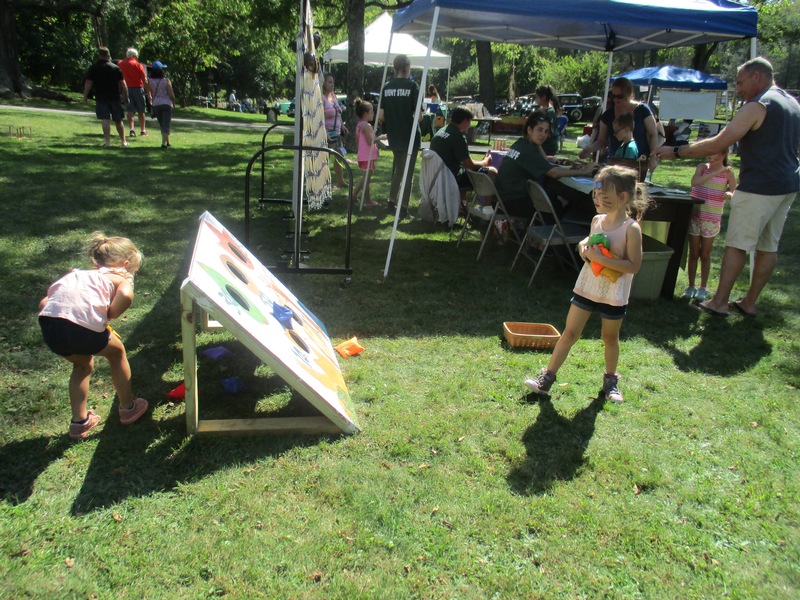 Despite 90-degree temperatures, nearly one thousand visitors of all ages spent the day at the Friends of Caleb Smith Preserve’s Fourth Annual Fall Festival on Sunday, September 24. 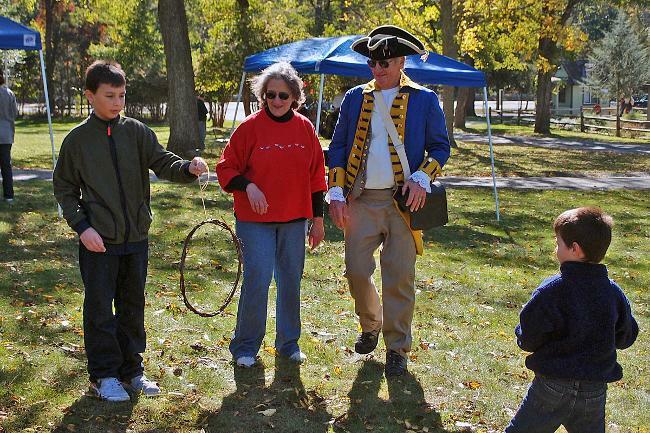 Children fished on the peninsula at Willow Pond, played Colonial and Native American games, made dreamcatchers and painted free pumpkins at the Crafts table and enjoyed nature events with popular naturalists Eric Powers and Jan Porinchak. Antique cars, Three Bees Aviary and other exhibits were on hand. 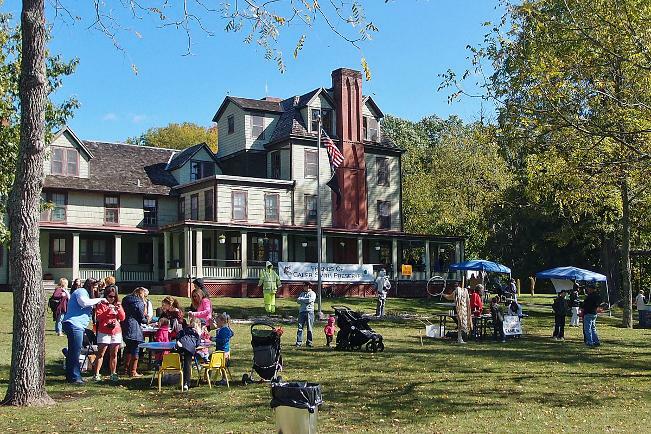 Musicians, including singer/pianist/songwriter Mike Tedesco, played on the back lawn as festival attendees listened, and enjoyed lunch at tables under tents. 1. 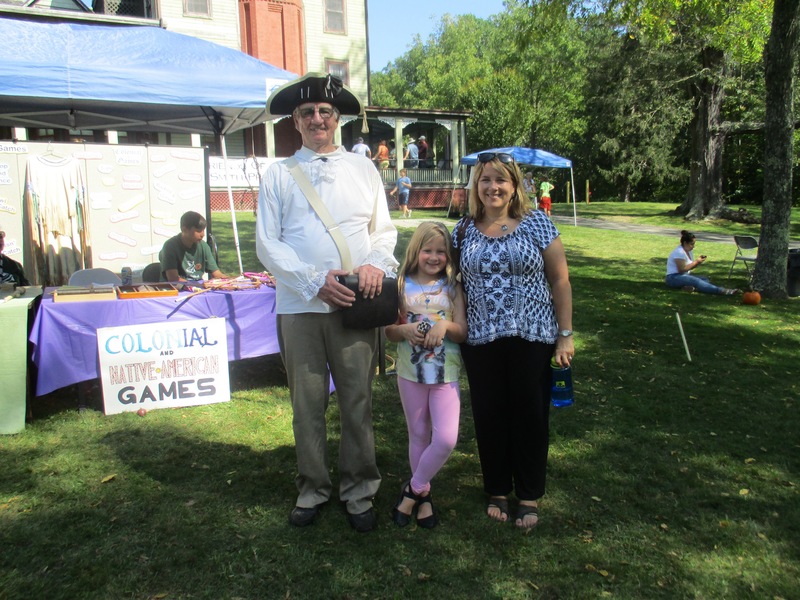 Alma Wegener, and her mom Lauri Christiansen Wegener, of Kings Park meet George Washington, who by afternoon had shed his prominent blue and gold jacket due to the heat. 2. 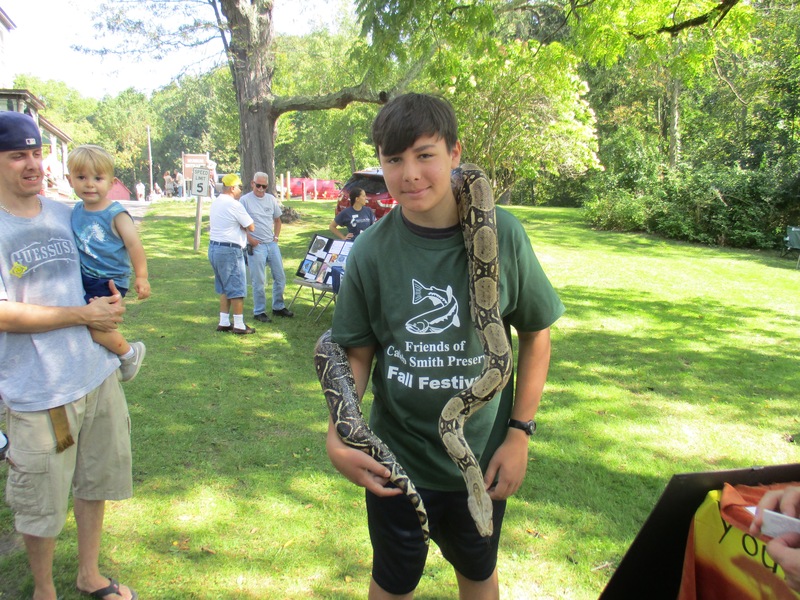 Jared Tetrault of Smithtown makes friends with naturalist Eric Powers’ boa constrictor. 3. Bean Bag Game is always a favorite. 4. A family enjoys the craft table. The fish in Willow Pond were biting at Caleb Smith State Park Preserve in Smithtown June 10 and as a result the Friends of Caleb Smith Preserve’s catch-and-release 15th annual Junior Fishing Tournament hit a record with a total of 259 fish caught by 30 anglers, ranging in age from five through twelve. All anglers caught at least three fish per person. 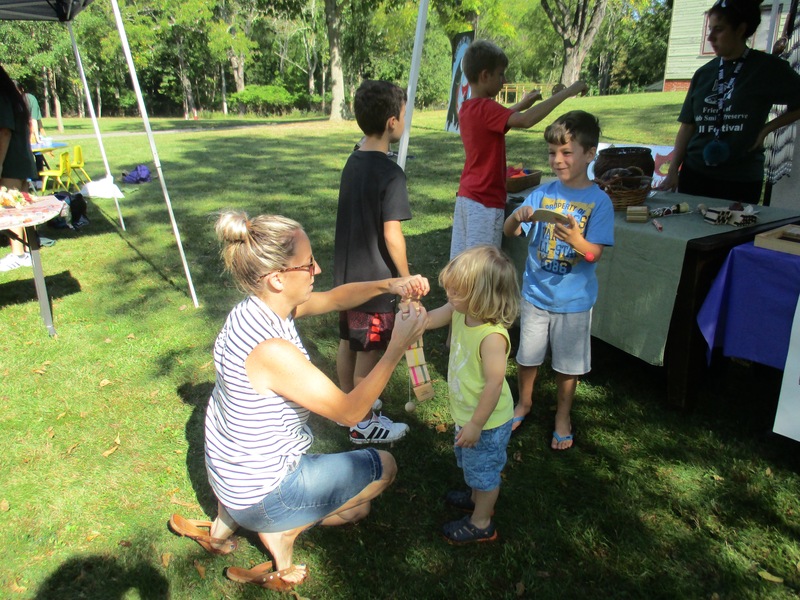 Winners of the morning session for those ages five to eight: Angelina Saeiocca, 5, from Bay Shore, won first prize for the most fish caught: 10; Thomas Lozada, 6, Massapequa Park, caught the largest pan fish, a 9-3/4-inch sunfish; Mia McGivney, 8, Rockville Center, caught the largest “other” fish, a 13-inch bass. 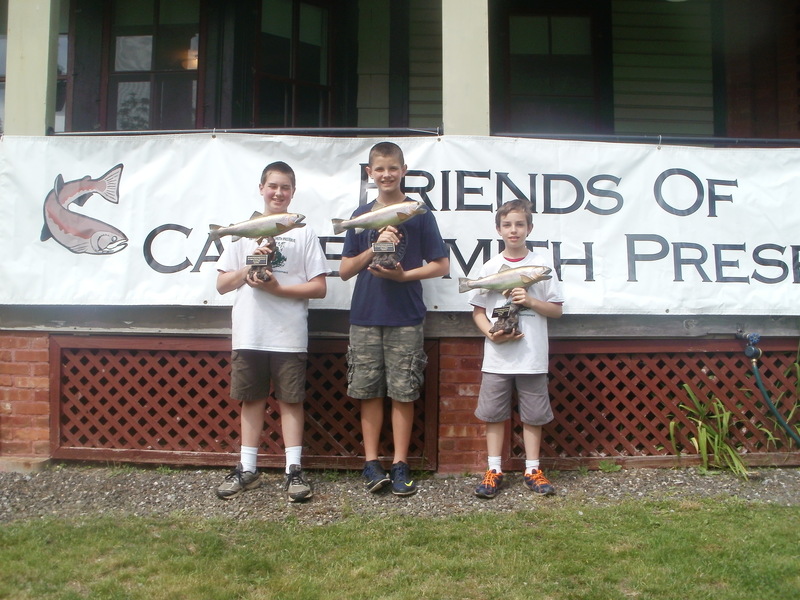 Winners in the afternoon session, for anglers ages nine through 12 were: Erik Trovitch, 12, from Smithtown, first prize for catching the most fish: 53; Matthew Cira, 9, Smithtown, caught the largest pan fish: a 10-inch sunfish; and Christopher Bellinger, 12, Smithtown, caught the largest “other” fish: a 14-1/2-inch bass. For Eric Trovitch, who won first prize last year as well for catching 17 fish, the day began with immediate good fortune. “He caught a total of 53 fish, and that’s the truth! He threw in his line and caught a fish within a minute!” said Carol Tokosh, whose husband Tom was chairman of the tournament. There were 19 anglers in the morning session who caught a total of 116 fish, and 11 in the afternoon session who caught a total of 143 fish. All participants received a free tee shirt and goodie bags. The Fisherman Magazine provided worms, bobbers, hooks and two rods for prizes. From left, Christopher Bellinger, Matthew Cira and Eric Trovitch celebrate a successful day of fishing during the afternoon session.